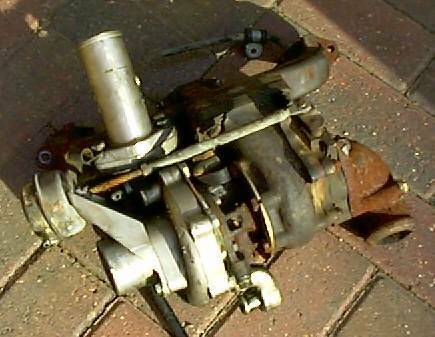 Salvaged the turbocharger from an MG Metro Turbo. 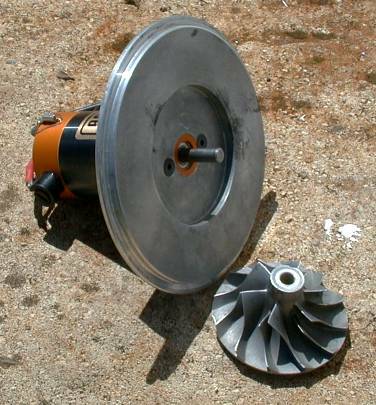 Turbo shaft with impeller and turbine. 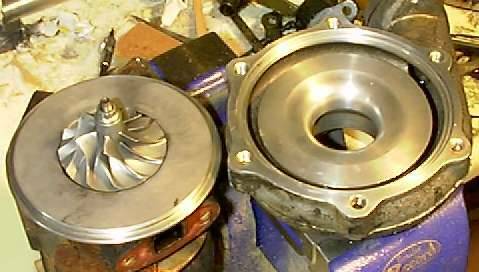 Noticed that the design of the impeller casing (cold side) has a large flat area outside of the impeller, presumably to make use of the energy in the air to create a larger pressure change. Machined down the casing to fit an Astroflight Cobalt 40 motor. 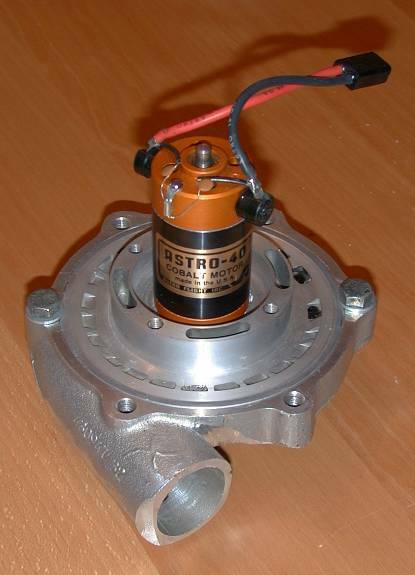 Luckily, both the Astroflight and the impeller use a 1/4" shaft. 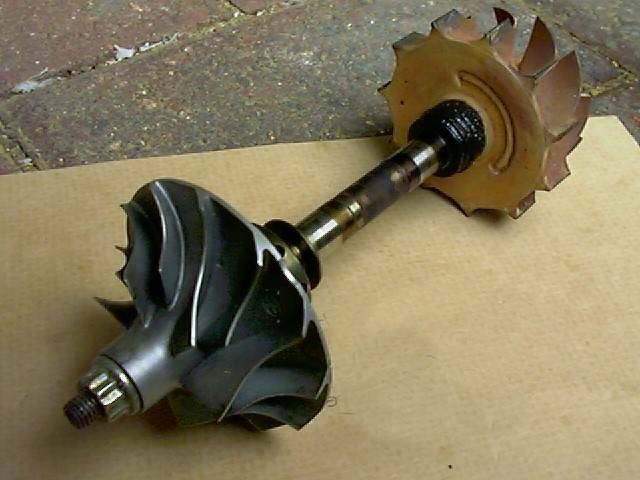 Just used a 4mm grub screw to secure the impeller to the shaft. This setup was able to generate a partial vacuum of about 15in of water, or 0.5 psi. Dominic performs initial tests on the sucker and seals... 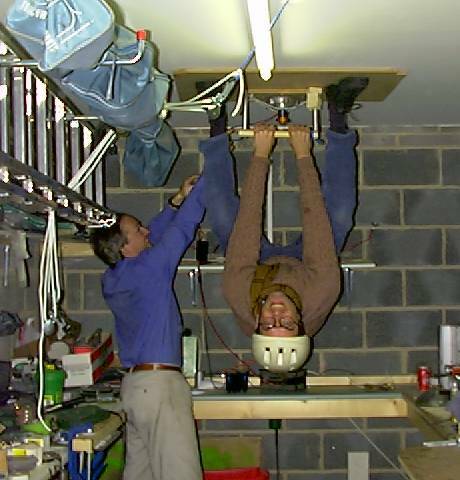 Both of us were able to hang from this test rig. An area on the underside of KillerHurtz was sealed with flexible door-sealing strips. You can see the turbo mounted at the back (right hand) edge. We though about including the wheels in the low-pressure area, but it would have been a big job keeping it all airtight. 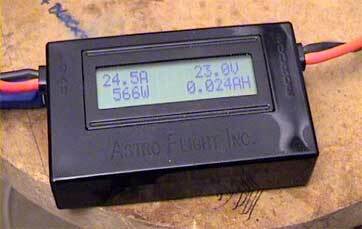 One of Astroflight's excellent little power-meters showing the current drawn by the motor. We were planning to have a two-stage switch to conserve power.